Topics: Services, Heat Treating, Machining, Industries, Fossil, and Nuclear. 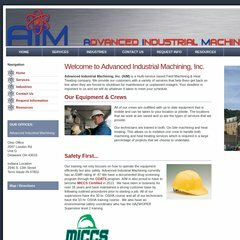 aimmach.com Contact Us - Advanced Industrial Machining, Inc.
aimmach.com Fossil - Advanced Industrial Machining, Inc. It is hosted by Godaddy.com Inc (Arizona, Scottsdale,) using Apache web server. Its 2 nameservers are ns51.domaincontrol.com, and ns52.domaincontrol.com. Its local IP address is 72.167.232.158. PING (72.167.232.158) 56(84) bytes of data.